That’s what everyone says? Right? The comments section is the place where the trolls and spammers hang out. Especially when the topic is controversial or polarizing. Or someone is having a bad day and wants to make trouble. That’s what the comment section is for. To make trouble. It can also be the place the spammers go when they think no one is looking. For example. I take a slight break (as unintentional as it might have been) and come back to a hell of a spam attack. Thank you, WordPress, for keeping an eye on that and keeping it at bay. As of this morning I was up to 942 spam messages for this month. Yikes. No comments have made it through (as far as I can tell). I knew going into this blogging business that spam attacks was going to be a concern. I’ve been a ghost blogger before, so I knew what to expect. Spammers see an opportunity to strike and they will take it. I’m not sure why they keep it up, though. How many people actually click those links these days? And, so far, no trolls. Hopefully they stay away, all though, I suppose, trolls mean your blog is successful and getting attention, right? No? Just me thinking that? But, unlike some, I think good can come from the comments section. Like today, I’m in a critique contest. The blog can be found here. Authoress (who runs said blog) has created an amazing community and an opportunity for people to get feedback on their work. And, don’t tell, but the occasional agent has been known to lurk there. I’ve been lucky enough to have stuff critiqued in other contests. It’s always scary putting stuff out there. Particularly a WIP that hasn’t exactly been edited yet. (Not to fear. I proof read it before I put it up, it’s just not perfectly polished yet. I think that’s OK, according to the rules.) What I really don’t like about it is that I’ve got this perfect image in my head and I’ve taken the image, put it into words and now you’re reading the words and peering into the image in my brain. I have to do a really good job to get you to see what I see. To hear, smell, see and feel what the MC is hearing, smelling, seeing and feeling. Yeah. It’s not pleasant but it is necessary, for two reasons. One, you’ve got to learn to put it out there, otherwise, you never will. Two, you’ve got to learn from all the comments that come in. Good one, bad ones, evil ones. How to find the positive and incorporate that into your work. How to handle the bad ones (and maybe find some good in them). Hence, good can come from the comments. You may not like what they have to say (trust me) but you can always learn something from the comments. Maybe you learn how to set things up for your world building, or how to write better dialogue. Or you can figure out why a scene isn’t working or why no one gets your MC. Or how to ignore the trolls and how to just keep going. So, if you get a chance, hop on over to that blog today and check it out. Take the opportunity to comment and read other’s comments. Maybe some good will come from it today. And, for fun, see if you can figure out which entry is mine. I have to reveal it by the end of the commenting period so let’s see who can find it. I apologize for the formatting of this post. I don’t know what is going on today. I have a friend who made a list of 20 fun things she wanted to do this summer. She managed to hit them all. I took a road trip which was pretty awesome. Stories to follow. And probably pictures. I also stayed off the Internet. Which was also pretty awesome. Every time I looked it was just more bad news and more awfulness and it was too depressing. I fed giraffes instead. Also, thoughts and stories to follow. But, August is basically over and I’ve done all I can do in terms of cramming summer fun in. It is, in my world, fall and that means it’s time to get back to work. With the new work schedule, I’m hopeful I’ll make decent progress. The goal is to have something ready to go out in early 2015. Yeesh. Just typing that is daunting but that makes the goal real, right? If only I could remember where I left off in the WIP. I guess that’s what outlines are for. 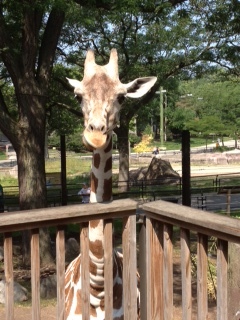 I’ll leave you with a picture of the giraffe I fed. His name is Ziggy.